This ESF-funded PhD examined the complex, personal factors that influence how people use their local environments to manage and promote their everyday wellbeing. It explored the role of green and blue spaces available in local areas – such as parks, woodlands and coastline, as well as people’s personal circumstances and past experiences. 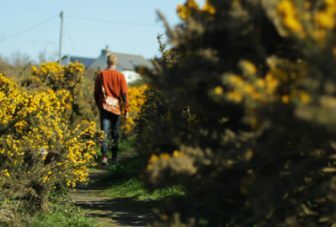 To help develop our understanding of how to design local environments that could promote improvements in everyday wellbeing, the project also partnered with Westley Design, a Cornish landscape architecture and inclusive design consultancy. Participants were initially asked to wear an accelerometer (a device that logs physical activity levels at regular intervals) and a GPS unit for seven consecutive days. The data from these two devices were used to create a set of personalised maps for each participant, showing where they went that week, how long they stayed in different places and how active they were. These maps provided a useful visual tool to guide discussion in the second stage of the research, which involved an in-depth qualitative interview with each participant. During the interviews, participants talked through each of their maps, discussing any visits or activities that they felt were linked to their wellbeing in some way, be it positively or negatively. Finally, a series of ‘go-along’ interviews were conducted in places deemed important by participants, offering further insights into the experiences and relationships playing out in these places. Taken together, this data highlighted that people seek out different green and blue spaces for diverse symbolic, immersive and social wellbeing experiences. Participants also made use of such spaces to progress towards personally meaningful goals, including those linked to physical fitness and other hobbies. Notably, these experiences were not always linked to people’s nearest environments, with many travelling further afield to seek out their preferred settings. Participants with less time also discussed the importance of being able to enjoy the natural environment en route to work or whilst undertaking other errands, even if fleetingly. Several participants described a strong affinity to the sea and an appreciation for the diversity of other relatively ‘natural’ green and blue spaces in the area, such as woodland and countryside trails. These spaces were often considered more immersive than local parks, though parks were still valued for providing attractive ‘through’ spaces, accessible contact with nature, and safe outdoor play spaces for children. Participants’ stories of immersion – or ‘losing themselves’ – illustrated how a number of different experiences often occurred during the same visit to contribute to an overall sense of enhanced wellbeing. For example, moments of focus on a specific activity (such as sailing or gardening) were commonly interspersed with an appreciation of the setting, including aspects such as bird song, open horizons, or the rhythmic movement of waves breaking at the coast. For some people, these experiences also involved elements of intense physical effort, allowing feelings of cathartic release, achievement and relaxation to follow. Others made the most of opportunities for easy conversation with valued, like-minded company or with passers-by. Importantly, the specific wellbeing experiences and settings sought out by participants varied according to their personal histories, day-to-day pressures, emotional and cognitive states, and life circumstances. The perspectives provided by this project emphasise the importance of engaging individuals in the design of their local environments. As noted by influential urban planner, Kevin Lynch, a fundamental part of design lies in understanding how people currently use and experience their local spaces. In doing so, one can identify the ‘subtle’ design details that could enhance inclusive opportunities to experience and interact with the local environment in a way that promotes a sense of wellbeing on a routine basis.